Yihiin teqawumoo yelibiyaa weyis yee gibtsi gira gebban poletika weyis haymaanot.wegen andbel goaraa leyyiteh tewaaga. "Negeru iskitaara wed qiltu kaara ale sewuyyewu be hihadeg gimgema lay 1986am. Egaa maal jennaree mana isaati jalqabe.MN Irraa. 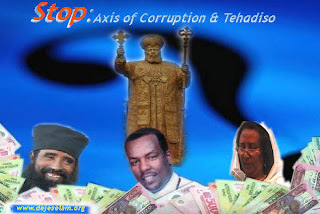 እባካችሁ ሁላችንም ስለ ቤተክርስቲያን ሰላም እና ደህንነት እንጸልይ! እግዚአብሄርም ይረዳናል!!!! ዛሬ በእግዚአብሔር ምሕረትና ይቅርታ ሀገራችን ኢትዮጵያ ከቀድሞ ጀምሮ በእግዚአብሔር ዘንድ የተመሰከረላትን የሃይማኖትና የአንድነት ጉዞ ተከትላ ወደፊት እየገሰገሰች የምትገኝበት ጊዜ ነው ፡፡ የመስቀሉ ዓላማ ልዩነትን በማስወገድ አንድነትንና ሰላምን ማረጋገጥ ነው፤ ይህ የአንድነት ሰንሰለት እስከመቼም ቢሆን መበጠስ የሌለበት ነው፡፡ ስለሆነም መለያየት የኃጢአት ውጤት እንደሆነ ሁሉ፣ አንድነት ደግሞ የሰለም፣ የፍቅርና የስምምነት ውጤት ነው ፡፡ ኤፌ. 2፡14-15 አሜን! Hailegiorgis, God Bless you. If we are a true christian, we have to know what you are talking about, but the big problem is in our country there is no the true Wongel precher. If they see one or two V.Good Wongel Sebakiyan, they get jelose and divided, and calling names. "Christ is the light of the world"
If the false acusiation people come to this light, every thing what they do, will show with this light. But right now they are in Dark. God open the False acusiation pepele eye, and let them stop being divided people. I wish Others like you understant the truth. In the words you said you got it right but the problem is with those who came openly preaching the same words of your saying but inside to inject heretic teachings that does not belong to the Holly Church. Just to save the church and its children from such heretics, what should we do? I mean other than praying? You understand what I am saying. Heretics come with purpose and plan; they keep throwing anything and everything in their capacity to dismantle the church. They are the dead evils who want to take everybody to their deadly devilish life. Thus what reactions should we have to abort these devilish plans? You know the church never folds her hand to embrace those who would come back to its bosom through repent and confession. But, from my experience the heretics who come with the deadly mission never repent but keep trying to execute their plans with many multifaceted methods. So our struggle is with these people? What do you suggest what we should as individuals and groups who belong to the Holly Church to defend the spiritual and physical treasures of the Church? Thank you, Hailegorgis. our church need a person like you.